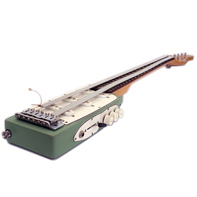 The Feedbackbass is a modified E-bass guitar. It is played with two monitors, which are connected to an amplifier, that is also connected to the BassGuitarDevice. 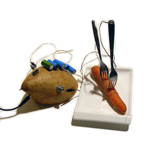 The Vegetable Sythesizer transferes resistance from vegetables into sound. By moving the folks you can pitch the sound. Electro-magnets hitting the strings of a common eggcuter, produce lyrical harp sounds. 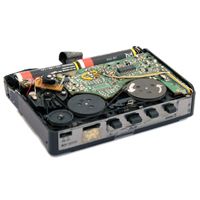 This special modied walkman can change speed and is also an excellent ciruit bending device. 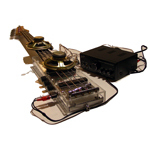 Selfbuild E-guitar mounted with pieces of thin metal, producing thunderlike sounds. 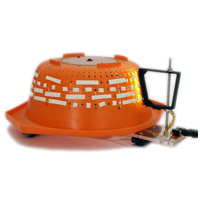 LED-Light through holes of a turning colander is triggering photoresistors in a special rhythm. 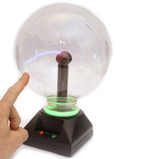 A modified Plasma ball produces twickling sound from lightenings by touching it. Forks transfere body-resistance into sound. By moving the folks the sound is pitched.